Muji pens are widely known among pen enthusiasts for their smooth ink and aesthetically-pleasing pen bodies. I heard good things about these pens so I sought to buy them as soon as a local Muji store opened in my city. Are they as good as everyone says they are? 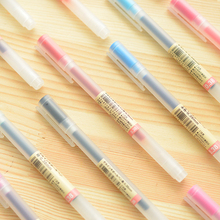 Today I’ll be reviewing the Muji Capped Gel-Ink Pens in various colours. These are light-weight gel ink ballpoint pens encased in a smooth, matte semi-translucent plastic body. The colour and pen point size are indicated on the top of the cap. I’ve used these pens for the majority of my last year at uni where I switched to handwritten notes instead of typing. It’s important to use pens that make your writing effortless and efficient. The pens are available in four different sizes: 0.25, 0.38. 0.5, 0.7mm and vary in their colour selection depending on the size. 0.38/0.5mm seems to have the most colours while 0.7mm is available in the basic colours such as black, blue, blue-black, and red. There’s also the 0.25mm pens which have coloured , hexagonal pen bodies that have more grip to them – a sort of rubber feeling – compared to smooth, matte body of the 0.38mm pens. The 0.25mm pen isn’t too different from the 0.38mm pen. I prefer the 0.38mm size because I find the 0.25mm a little too thin – almost as if it’ll break if I press too hard. 0.38mm is great for character writing to keep strokes crisp and clear. It’s my favourite size among these pens because I like to write very small and fast in lectures. I actually don’t own any 0.5mm Muji Capped Gel-Ink pens, so I resorted to reviewing the retractable one one I got as a gift from a co-worker. Nonetheless, I still really like this one for making some quick notes. It has a larger grip for a comfortable hold and you can continuously click it when you’re stressed. The 0.7mm pen is much inkier than the other sizes, which I did not enjoy. It tended to leave globs of ink where I started to put the pen down on the page, which I would inevitably smear unknowingly. Perhaps I was just unlucky and bought a dud. I would say this size is more suited for those enjoy large writing or like to use 0.7mm pens/pencils. It just doesn’t work for me. Somehow I managed to finish using mine though haha. Majority of the colours are highlighter and water-proof. It’s difficult to capture the true colours of the inks. Majority of the colours are a little deeper than what’s shown above and the Sakura colour resembles a highlighter, coral colour. Perhaps the 0.25mm pen contains a different type of ink because it seemed less waterproof than the other pens and it also smudged a bit with the highlighter. In the older pens, the colour of the pen is indicated on the label in Japanese, but in the newer ones, they’ve replaced it with the Muji logo. I find a little ironic because their name literally means “no name/no brand”. If you don’t have a Muji store near you, consider ordering from their website or you can also find the pens being sold on Amazon and Aliexpress. Do you want more pen reviews? Comment down below the kind of pens or other art supplies you want reviewed!